This simply exquisite 9 carat white gold ring features a diamond set into a 4-claw design, making the stone the focal point of the whole ring. Its twisted diamond set shoulders add a modern element to this otherwise classic and timeless piece. 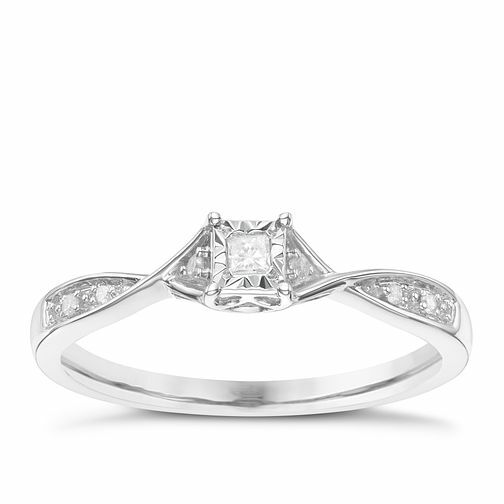 9 Carat White Gold Diamond Set Shoulder Solitaire Ring is rated 4.0 out of 5 by 4. Rated 5 out of 5 by Anonymous from Simply stunning Saw this ring wanted it! It looked fantastic on the site so in real life I was amazed! Looks delicate but a strong ring if that makes sense! So so happy it’s gorgeous and unusual ? ?